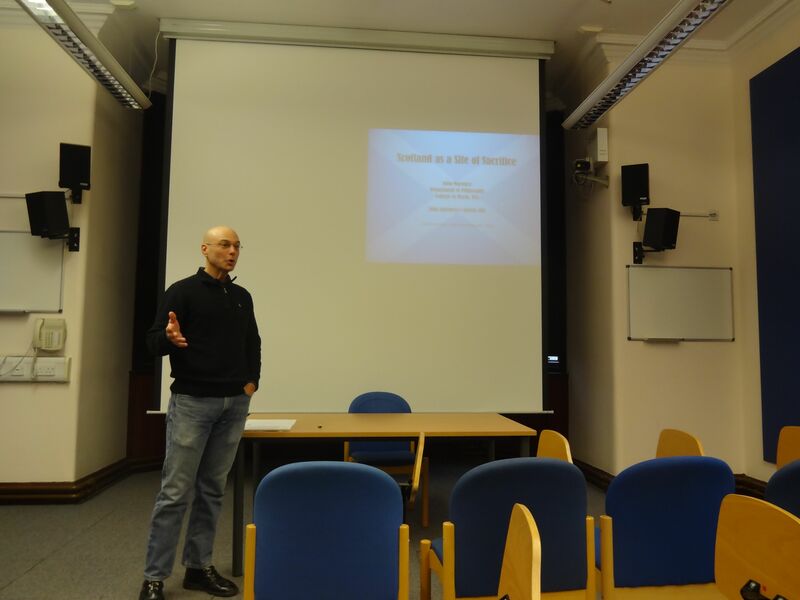 While in Scotland I delivered my presentation, “Scotland as a Site of Sacrifice” twice: once to the faculty of film studies at the downtown campus of Glasgow University and then to the department of interdisciplinary studies at the Dumfries campus. The experience was very positive, and it was a wonderful chance to meet a number of scholars whose works have contributed to my understanding of Scotland and its depiction in film; scholars such as David Martin-Jones, Ian Goode, David Archibald, Karen Lury, Benjamin Franks and Stuart Hanscombe. 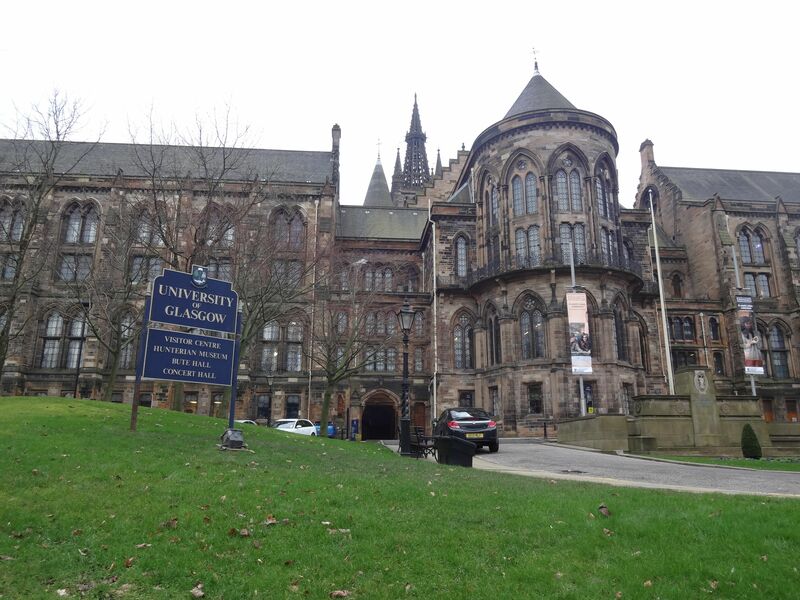 Glasgow University was founded in 1451, making it the fourth oldest university in the English speaking world. The main campus is awe-inspiring. There is a tall, gothic spire visible from the distance, and the main building around which the rest of the school is centered looks like a castle. I delivered my paper in Gilmorehill Hall. From the outside it, like the main building, looks like a structure from the ancient past. Once you step inside, however, the place is completely modern, with a state-of-the-art movie theater, glass enclosed offices, and classrooms outfitted with full technology. The Dumfries campus is unusual in that its grounds are shared with the University of West Scotland, Dumfries and Galloway College and the Open University. The whole campus is referred to as “The Chrichton,” which caused me some confusion when I was trying to find it. The idea behind this arrangement was to bring higher education to a region that previously had no established universities or colleges. 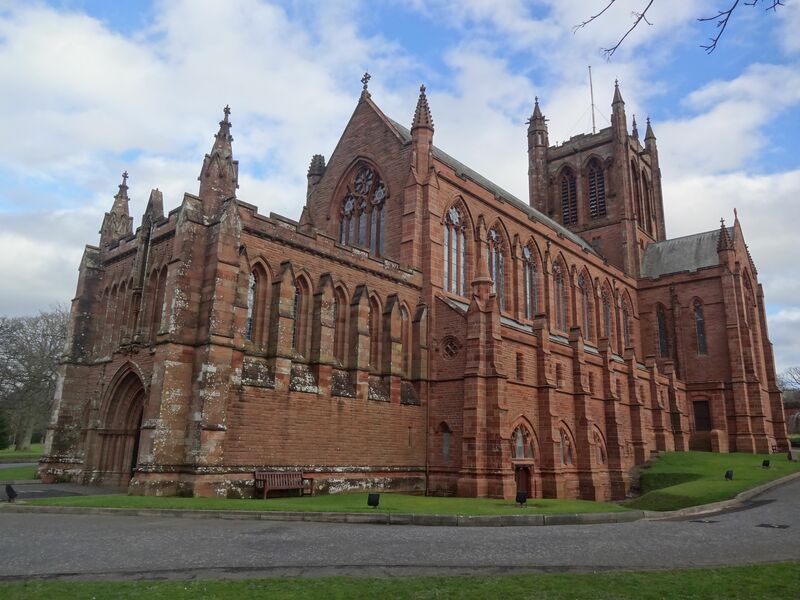 Although Dumfries is only about two hours south of Glasgow, the town is small and most of the surrounding areas are rural, consisting of farmland, sheep pastures and ruins. This entire southern area of Scotland is referred to as the Dumfries/Galloway region. The Chrichton, like the main campus of University of Glasgow, is home to some amazing buildings. The most impressive is a gothic church called the Chrichton Memorial Church, which was completed in 1897. It stands in the middle of the campus, commanding your attention as you approach. This is the sort of structure that I always imagined as the anchor point of an old and respected educational institution; and it is a far cry from what I’ve become used to on the west coast of the US where most things are temporary and impermanent. There is something comforting about a campus where you know that the buildings have been around for a long time and that they won’t disappear tomorrow. It makes me think, in contrast, of my own school, the College of Marin, which is currently undergoing a radical transformation with most of the old edifices being torn down and shiny, new, modern ones being put up. I delivered my presentation first at the downtown campus and then drove south to Dumfries the following week. This gave me the opportunity for a road trip during which I stopped along the way to explore some of the locations where the classic 1973 British film The Wicker Man had been filmed. My presentation deals with this movie extensively, and so this was a terrific chance to do some on-the-ground research that would enrich my understanding of how the actual geography of Scotland is related to its cinematic representation. 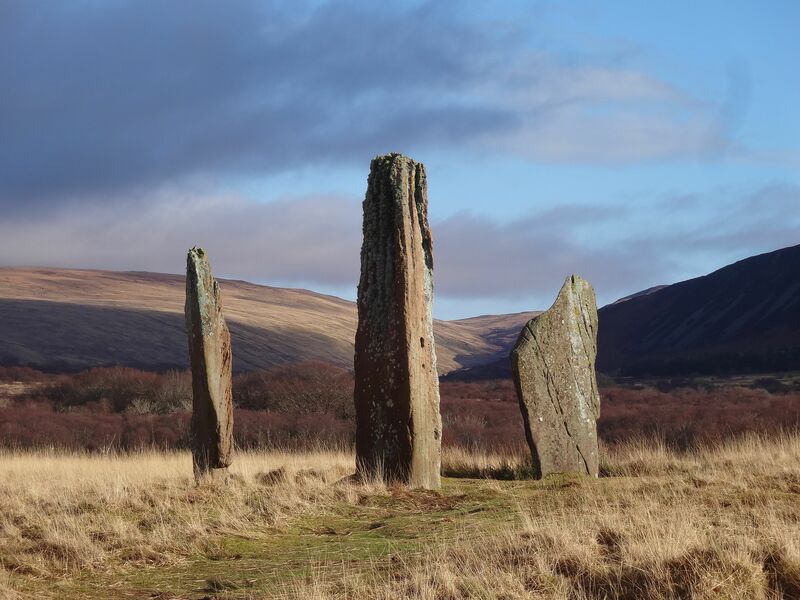 Renting a car, I followed the A77 down the west coast, and as I ventured further and further into this area, I developed an increasing sense of an ancient past that has not yet been overwritten by modern influences. I could imagine that the people populating many of these small towns and rural villages live lives in many ways similar in daily rhythm to their forefathers: fishing, ranching, herding sheep, going to church. As always, the driech, grey and drizzly weather contributed a dreary backdrop to the scenery, helping me to feel like there was something mysterious and a bit sad about the landscape. 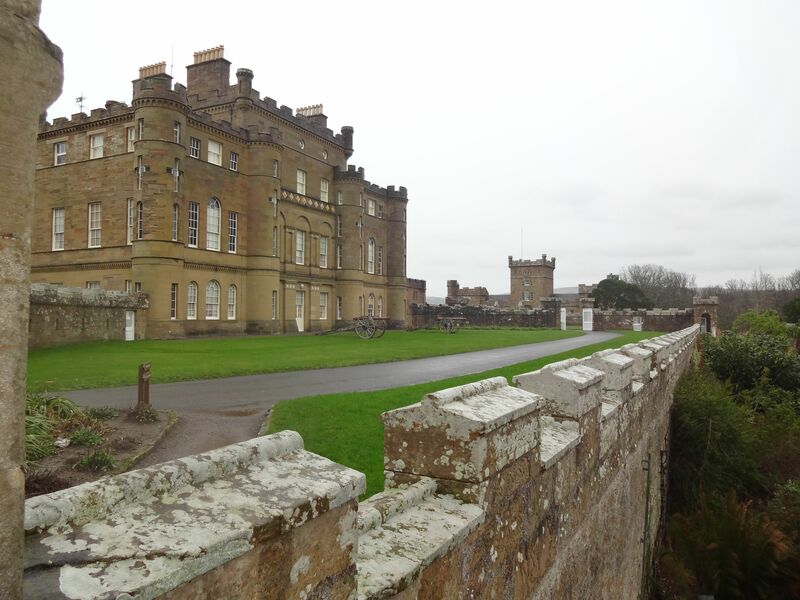 My first stop was Culzean Castle, which served as the exterior for Lord Summerisle’s residence in The Wicker Man. The castle itself was closed when I arrived, but the grounds were open, so I wandered around taking in the spectacular ocean vistas and surveying the castle and its gardens. As I walked up to the structure, I immediately remembered the scene from The Wicker Man when Sgt. Howie meets Lord Summerisle at his home. The approach to the castle is exactly reproduced in the film, and being there gave me a weird feeling like fantasy was blending into reality. It was beautiful, majestic and a bit spooky all at once. I had booked a room in the coastal town of Portpatrick, so this was my stop-off point at the end of the first day. A storm was kicking up by the time I arrived, and the shoreline was a maelstrom of waves crashing against black rocks while rain poured down from the sky. The middle of winter is not the tourist season here, and yet I found myself feeling supremely happy that I was able to see this place under these conditions. As I stood by the shoreline, I was mesmerized by the chaos of the ocean and invigorated by the wind and pelting rain. 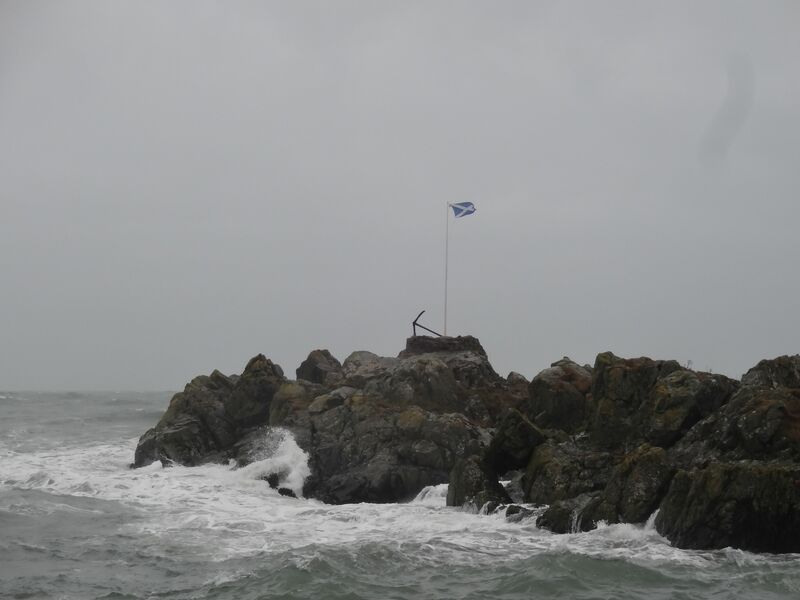 A Scottish flag, planted in a hill of rocks by the harbor, flapped and snapped in the squall. There was no doubt about the fact that I was in Scotland, the severe, cold wilderness to the north of England. The next morning I hit the road, this time traveling east on the A75. I dropped south onto 747 so that I could visit St. Ninian’s Cave and Burrow Head, both of which served as locations for the filming of The Wicker Man. The route southwards is very narrow and a bit treacherous. I think I probably pissed off many of the locals with how slow I was driving, but the last thing I wanted to do was to end up careening off of the side of the road and into a ditch, so I continued on at a snail’s pace to Whithorn, where I saw a sign directing me to my next stop. The finale of The Wicker Man occurs when the character Sgt. Howie is lured to a rocky beach where he finds the young girl he has been searching for throughout the film. 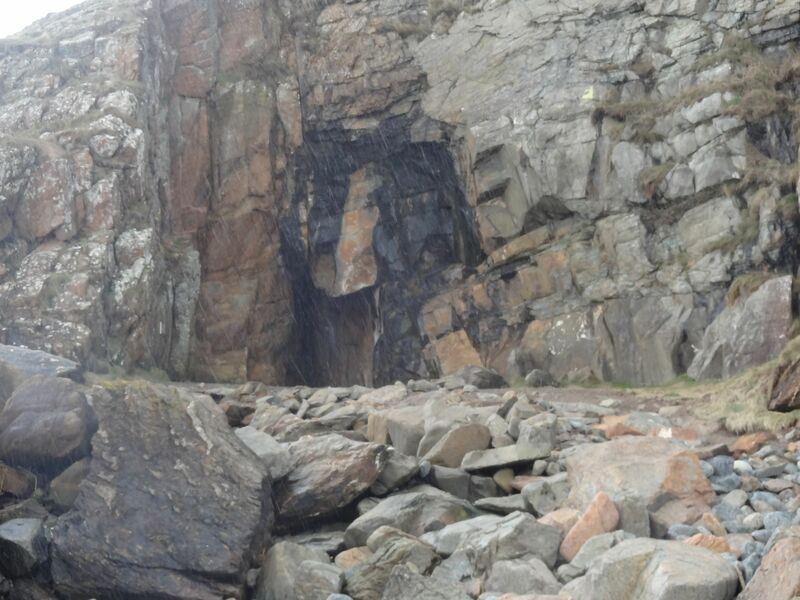 She is standing in the mouth of a cave, which in reality is St. Ninian’s Cave. The location is reached by way of a mile-long walk down a pathway that starts in a cow pasture, goes through a forested area, past a sign warning of dangerous bulls and ends up on the beach. When I arrived at the trailhead, the rain was coming down and I had to trudge through the mud in order to reach my destination. At first I wasn’t sure if I was in the right place as there are no signs directing you to the cave once you hit the shoreline. I looked about and finally found it. In reality it is less like a true cave and more like an indented opening in the rock cliff next to the water. It was an unexpectedly moving experience coming to this place. St. Ninian is credited with being the first person to bring Christianity to Scotland sometime around 400 AD. The cave is supposed to have been where he prayed on a regular basis and now, in addition to being a film location, it serves as a point of pilgrimage for the faithful. All around the entrance lie religious mementos: crosses, rocks inscribed with prayers, memorials for dead loved ones, and flowers. This is obviously a meaningful place for many folks, connecting them with a man from hundreds of years ago who devoted his life to his religious mission. It makes sense that this was chosen by the makers of The Wicker Man as a spot in which to depict a confrontation between paganism and Christianity, as both world views really did encounter one another here. Continuing south, my next stop before heading for Dumfries was Burrow Head. Burrow Head is now a caravan park, perched right next to the water, and it is where the final burning of the wicker man took place. I immediately recognized the location when I arrived. A grass lined path leads down a small hill to a clearing, encircled by jagged rocks and crashing ocean waves. In the film, this is where the villagers stand as they watch the burning of their sacrifice on the hill above. 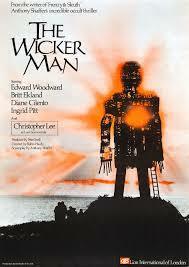 Apparently there were three wicker men built for the movie, only one which was ignited. The remains on the shore are those of an unburned wicker man. 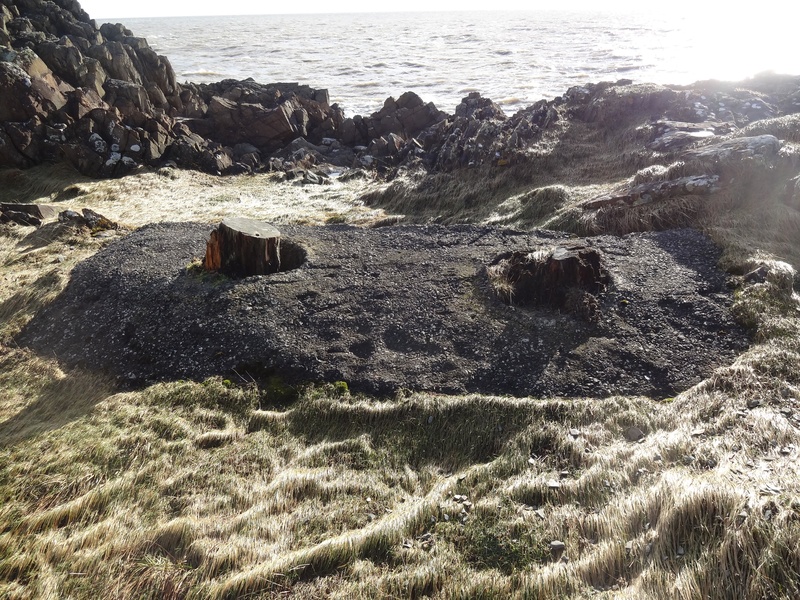 Although the only things left are two wooden posts embedded in concrete, I still felt a surge of excitement as I reflected on the fact that this was where Christopher Lee argued about the nature of sacrifice with Edward Woodward before committing him to flames in the movie. Here was a not so ancient artifact, marking the landscape discreetly, but nonetheless acting as a significant reminder to visitors of how human beings feel compelled to alter their environment as they make things and engage in existential projects. I must confess that these two posts, despite their plain and simple appearance, were no less remarkable to me than Culzean Castle or St. Ninian’s Cave. My own Wicker Man pilgrimage was completed by passing through Creetown and Castle Douglas, two more places that served as sites for the making of the movie, before heading off for two nights in Dumfries. After my presentation, I departed northwards, and back toward the west coast for a two night stay on the Isle of Arran. The trip requires a ferry ride, and though Arran is not a complete backwater, there is a feeling of relative isolation that comes from being on an island that is sparsely populated and separated from the mainland. Arran is not a big island. It only takes a few hours to drive its circumference, and over the course of that drive most of what you see are sheep, ocean views, and collections of buildings too small to be called villages. I stopped along the east coast in order to take a hike across a sheep pasture to visit an ancient set of artifacts, dating to some 2000 years BC, which stretch out along a protected pathway in the middle of a flat moor. Along the path are a number of “cairns,” or burial sites where ancient tribe leaders have been layed to rest. Each cairn is marked by a ring of stones surrounding a mound of earth. As you continue along, there appear monoliths jutting up into the air in the near distance. These structures become more and more prominent as you advance, looming against the landscape like giant rock blades embedded in the earth. They are ancient pillars, placed in this location for reasons that no one is sure of, but which may have to do with the marking of tribal boundaries or with some sort of religious/cerimonial purpose. As with St. Ninian’s Cave and the wicker man legs at Burrow Head, there was something moving and sublime about these stones. They protrude into the air, standing about 15 ft tall, defying gravity as they jut upwards. Their stark, silent simplicity is dramatic and striking against the otherwise flat landscape. Here is a place where thousands of years ago people lived their lives, pursuing routines that modern humans can’t even understand. I felt a chill looking at this place, knowing that in the distant past there were human beings who methodically placed these monoliths here for some deliberate reason that is now lost. Today they still stand, for no utilitarian purpose other than for people like myself to gaze awestruck and to wonder why they are there. This week-long adventure to the south of Scotland helped me to understand a number of things. Seeing these locations, walking around them, being in the spots where some of the key scenes from The Wicker Man were staged revealed how the actual geography of Scotland has contributed to the making of this modern cinematic masterpiece. My additional trip to Arran further helped to reinforce the sense of Scotland’s silent, mysterious and yet unmistakable prehistory. The legacy of human culture and religious practices here is ancient, going back to a time even before Christianity made its way to Britain. This landscape and the monuments that adorn it are reminders of the ongoing projects pursued by both prehistoric and contemporary humans. I will deliver my presentation “Scotland as a Site of Sacrifice” on January 30th at the University of Glasgow, in Glasgow Scotland and then again on February 5th at the Dumfries campus of the University of Glasgow. Friedrich Nietzsche delineates three stages of sacrificial behavior. The first stage consists of the sacrifice of particular human beings to a god. 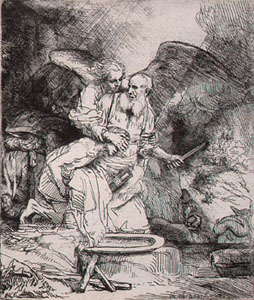 The second stage involves the sacrifice of one’s own instincts to a god, and the third stage culminates in the sacrifice of God himself. (BGE: 55) This last stage describes the death of God and signals the “final cruelty” of our present times. Our age is the age of nihilism, the point in history during which humans “sacrifice God for the nothing,” fulfilling a kind of nihilistic sacrifice. In this presentation I examine three different cinematic depictions of sacrifice, two of which clearly illustrate Nietzsche’s first two stages and the last of which suggests the possibility of the third, nihilistic stage. The films I have selected share a common thread insofar as they all take place in Scotland. The first two films,The Wicker Man (Robin Hardy, 1973) and Breaking the Waves (Lars Von Trier, 1996), take place in rural, northern Scotland, capitalizing on what scholars have called the myths of Tartantry and the Kailyard in order to depict sacrifice as something disengaged from the modern world. 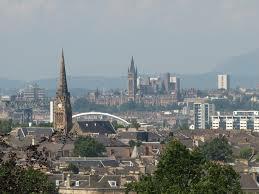 The third film, NEDs (Peter Mullan, 2010), takes place in modern Glasgow and draws on a myth that scholars call Clydesideism. This myth highlights the postindustrial, gritty, urban face of Scotland. In NEDs, the sacrifice made by the main character is of a sort thinkable only in modern times and in an urban setting, and it comes very close to what may be a kind of nihilistic sacrifice. For more information, visit Screen Seminars at Glasgow.